One of the most exciting developments over the lifetime of MongoDB must be the inclusion of the WiredTiger storage engine in MongoDB 3.0. Its very design and core architecture are legions ahead of the current MMAPv1 engine and comparable to most modern day storage engines for various relational and non-relational stores. One of the most compelling features of the WiredTiger storage engine is compression. Let’s talk a bit more about performance and compression. There are a lot of new configuration options in 3.0 so let’s take the notable options one by one. storage.engine. The setting ensures we are using the WiredTiger storage engine. Should be set to “wiredTiger” to use the WiredTiger engine. It can also be set to “mmapv1”. MMAPv1 is the default in 3.0, but in MongoDB 3.1 (potentially) this will change to wiredTiger. storage.wiredTiger.engineConfig.cacheSizeGB. This sets up a page cache for WiredTiger to cache frequently used data and index blocks in GB. If this is not specified, MongoDB will automatically assign memory up to about 50% of total addressable memory. storage.wiredTiger.engineConfig.directoryForIndexes. Yes! We can now store indexes on a separate block device. This should help DBAs size, capacity plan, and augment performance as needed. storage.wiredTiger.collectionConfig.blockCompressor. This can be set to ‘snappy’ or ‘zlib’. Snappy having higher performance and lower compression than zlib. Some more detail later on compression algorithms. storage.wiredTiger.indexConfig.prefixCompression. This setting enables prefix compression for indexes. Valid options are true|false and the default is true. WiredTiger is going to be much faster than MMAPv1 for almost all workloads. Its real sweet spot is highly concurrent and/or workloads with lots of updates. This may surprise some folks because traditionally compression is a trade off. Add compression, lose performance. That is normally true, but a couple of things need to be considered here. One, we are comparing the MMAPv1 engine with database level locking to WiredTiger with document level locking. Any reasonable concurrent workload is almost always bound by locking and seldom by pure system level resources. Two, WiredTiger does page level compression. More on this later. There are a few things that make WiredTiger faster other than its locking scope. WiredTiger also has a streamlined process for free space lookups and management and it has a proper cache with its own I/O components. Because WiredTiger allows for compression, a common worry is the potential for overall performance impact. But as you can see, in a practical sense this worry is mostly unfounded. A couple graphs for relative performance difference for sysbench-mongodb. It should be noted that WiredTiger is using defaults in this configuration, including snappy compression and index prefix compression. The cache generally stores uncompressed changes (the exception is for very large documents). The default snappy compression is fairly straightforward: it gathers data up to a maximum of 32KB, compresses it, and if compression is successful, writes the block rounded up to the nearest 4KB. The alternative zlib compression works a little differently: it will gather more data and compress enough to fill a 32KB block on disk. This is more CPU intensive but generally results in better compression ratios (independent of the inherent differences between snappy and zlib). Not all data sets compress equally, it depends on the data format itself. Data compression is temporal. One day being better than another depending on the specific workload. One approach is to take a mongodump of the dataset in question then mongorestore that data to a compressed WiredTiger database and measure the difference. This gives a rough measurement of what one can expect the compression ratio to be. That said, as soon as the new compressed database starts taking load, that compression ratio may vary. Probably not by a massive margin however. It should be noted there are some tricky bits to consider when running a database using compression. Because WiredTiger compresses each page before it hits the disk the memory region is uncompressed. This means that highly compressed data will have a large ratio between its footprint on disk and the cache that serves it. Poorly compressed data the opposite. The effect may be the database becomes slow. It will be hard to know that the problem is the caching pattern has changed because the compression properties of the underlaying data have changed. Keeping good time series data on the cache utilization, and periodically checking the compression of the data by hand may help the DBA understand these patterns better. MongoDB 3.0 has a new storage engine API, and is delivered with the optional WiredTiger engine. MongoDB 3.0 with WiredTiger is much faster than MMAPv1 mostly because of increased concurrency. MongoDB 3.0 with WiredTiger is much faster than MMAPv1 even when compressing the data. Lastly, remember, MongoDB 3.0 is a new piece of software. Test before moving production workloads to it. TEST TEST TEST. If you would like to test MongoDB 3.0 with WiredTiger, ObjectRocket has it as generally available and it’s simple and quick to setup. 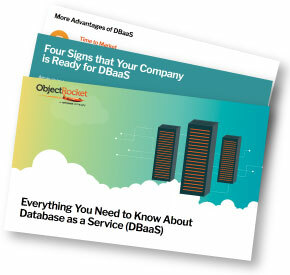 As with anything ObjectRocket, there are a team of DBAs and Developers to help you with your projects. Don’t be shy hitting them up at support@objectrocket.com with questions or email me directly. Note: test configuration and details documented here.